Mini One Clubman revealed | What Car? 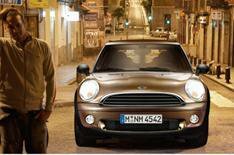 Mini will unveil the new entry-level Mini One Clubman at the Geneva motor show in March. The One estate will be powered by a 94bhp 1.4-litre petrol engine with 103lb ft of pulling power. A six-speed manual gearbox will come as standard, with an optional six-speed automatic 'box is also available. Air-con will be standard, too. Fuel-saving technology includes a brake energy regeneration system, stop-start and a gearshift indicator. Average fuel consumption will be 52.3mpg, and C02 emissions of130g/km. That means it will sit in VED road tax band D, costing 120 a year. The car will go on sale March 28, from 13,290.